Aruba is often known for its tropical climate and columnar cacti that decorate its natural landscape. However, less is known about the importance of bats for the existence of these cacti. >On Aruba approximately seven different bat species have been identified and are further dived into insectivores (insect eating bats) and frugivores (fruit eating bats). Both insectivores and frugivores are essential species that preserve the biodiversity on Aruba. Certain plants that solely bloom at night, such as different columnar cacti and also Aloe, are solely dependent on frugivores for their pollination and/or seed dispersal. The insect eating bats contribute to the control the insect population on the island. An insect eating bat is able to eat up to 300 insects per night. Unfortunately, Aruba’s bat fauna is being threatened due to habitat fragmentation, reduction of food sources and disturbance of their natural roosts. In March 2012 Arikok employees, together with various highly motivated partners, participated in a bat monitoring workshop held at the Park. 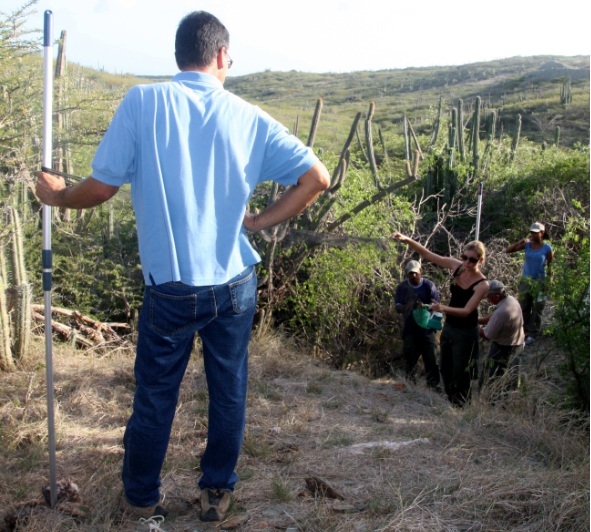 Participants were trained on how to safely and responsibly monitor captured bats by the two bat experts Jafet M. Nassar (IVIC, Venezuela) and Fernando Simal (STINAPA, Bonaire). As a result of the bat workshop the Arikok bat monitoring team was formed. 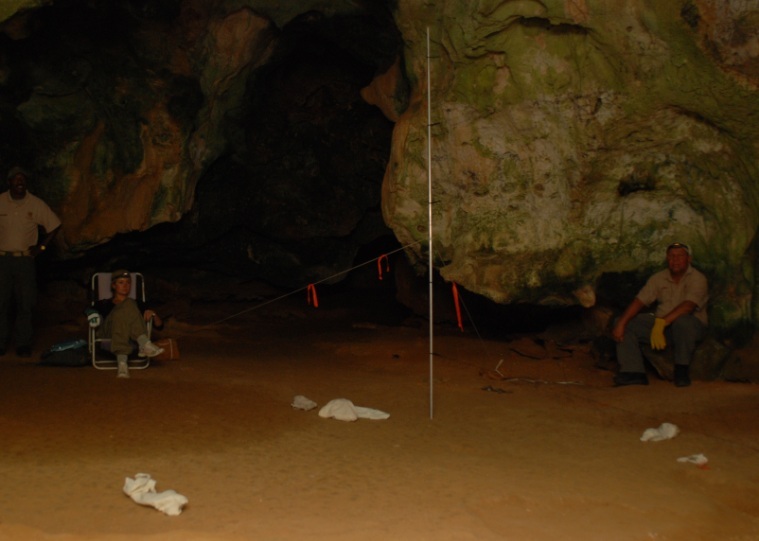 The monitoring of the Aruba’s bat fauna is part of a long term research project that focuses on gathering crucial information in order to formulate sound recommendations on how to better protect the bat fauna within the park. The Park aspires to do the latter in a strategic and sustainable way. The first monitoring phase (baseline research) is currently being conducted and includes the monitoring of bats during every two months during one year at four previously defined locations within the Park. These locations are Arikok’s caves Quadirikiri and Baranca Sunu (Tunnel of Love) and Arikok’s mineshafts Wela and Miralamar. The caves and mineshafts have been identified as suitable monitoring sites due to a pre-inspection conducted by the two bat experts. 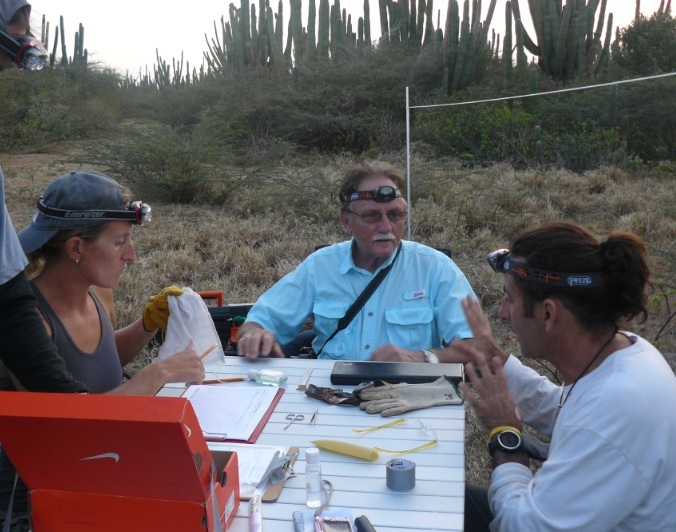 By conducting these monitoring sessions the ‘bat team’ hopes to acquire crucial information such as; the different bat species found on Aruba, their population dynamics, their eating patterns and minimal requirement for their habitats ( their basic needs in order to survive). Following the first monitoring phase, the second monitoring phase (long-term monitoring) will be conducted during which the monitoring sites will be visited twice a year. The latter is done in order to generate year-to-year data on the dynamics of the use of the selected monitoring sites. During the third monitoring phase (protection and management program formulation) management decisions for the protection and conservation the Aruban Bat fauna will be made (note that certain management decision have already taken place and include outreach). A healthy bat population is crucial for a healthy ecosystem and therefore crucial for Aruba’s natural surroundings. Photo 1: The mist nets are placed near the entrance of the bat roost. This is can be a cave or mineshaft. Photo 3: As soon as the team is set the waiting for the first bath capture starts. Photo 5: Between 19:30 and 20:30 there is a peak during which most bat leave their roosts. 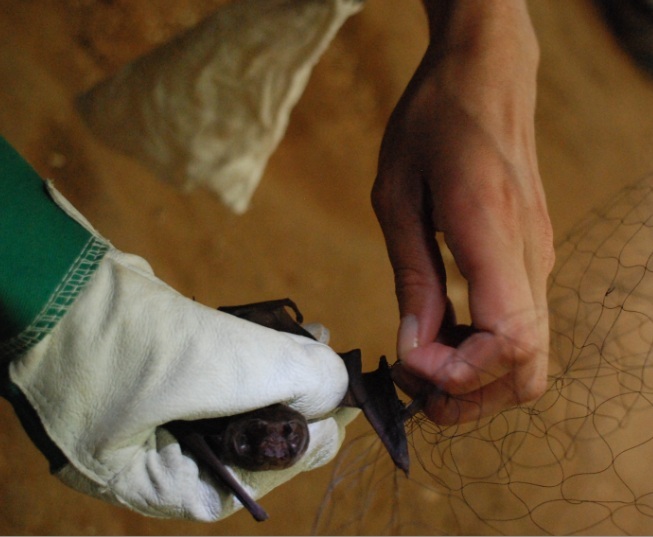 Often multiple team members assist each other in order to safely release the bats from the mist net. 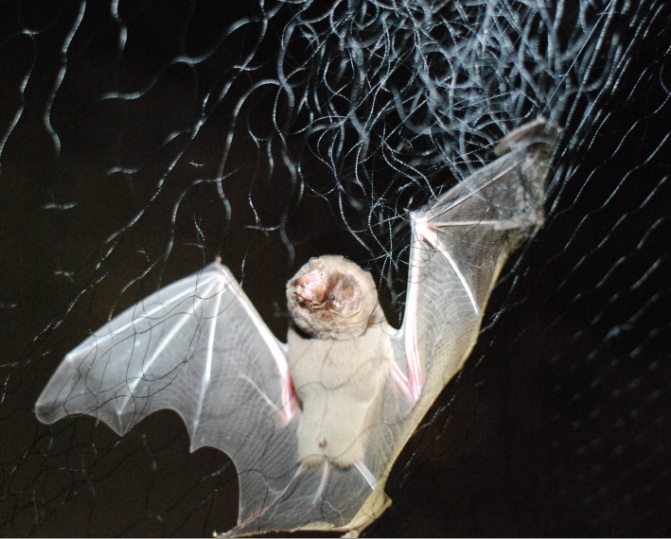 Photo 6: Releasing the bats from the mist net requires precision work due to the fact that its featherlike wings often tangle within the mist net.